A self-watering tomato planter all but takes away the main obstacle to growing tomatoes successfully in containers: watering. Keeping container tomatoes watered satisfactorily is a huge challenge. One of best self-watering tomato planters for home gardeners is Tomato Success Kit by Gardener's Supply. More on that product in a minute. But first let's answer this question: why is a self-watering tomato planter is so beneficial? It’s common for tomatoes grown in pots to suffer from a “drought-and -drown” cycle. Their roots dry out in the heat of the summer. But when watered too often or without adequate drainage, they can be flooded quickly. Watering is the single most significant factor in container tomato stress. A self-watering tomato planter helps moderate that stress and make consistent water available to plants. The planter doesn’t dry out every day. It doesn’t “forget” to water. Nor does it over water. If you grow tomatoes in a self-watering planter, you can go away for a weekend or even on vacation and not worry about your plants. A self-watering tomato planter is especially helpful if you have poor soil quality – if you live in desert or rocky areas, for instance – because you use quality potting mix in the planter. A self-watering tomato planter has other advantages. Planters can be moved from place to place if there is too much sun, too little sun, cold, frost, or severe weather in the forecast. You can keep planters on your patio or deck, away from deer and rabbits. 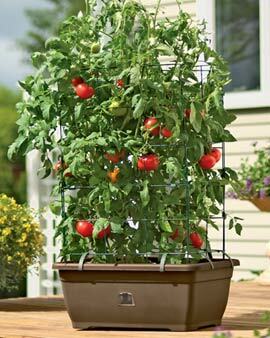 The Tomato Success Kit includes everything you need to grow tomatoes in containers (except tomato seedlings): the planter, 40 quarts of self-watering container mix, 1 pound organic fertilizer (5-6-5), and support cage with 8 foot legs and clips. It’s a good thing seedlings aren’t included – you’ll want to choose best container tomato varieties appropriate for your climate. Putting the planter together is quick and easy. Clear directions for assembly are included. With a volume of 10 gallons, the planter is large enough to easily sustain a tomato plant or two. It’s twice as large as needed to grow tomatoes successfully. The planter has a built-in water reservoir in its base. The reservoir is separated from the planter’s main body by a reservoir platform with channels. Water moves up from the reservoir through the channels to the main body of the planter when planter mix is dry. When you set up your planter, make sure you press a few inches of pre-moistened planting mix through the channels. The moistened mix wicks water up into the main body of the planter. The moisture will continue to move upwards only so long as the soil is dry. The side of the planter has a fill hole and a cover. Water the planter through the fill hole using a garden hose. This way, you avoid watering the tomato plant directly, which prevents spreading diseases. The fill hole has a cover. That keeps out mosquitoes. You need to refill the water reservoir around once or twice a week. Check your planter soil and the water gauge each day to see if it’s dry. Spread a layer of red plastic over the surface of the planter to repel excess water when it rains or move the planter under cover when the forecast is for a downpour. 40 quarts of potting mix comes with the kit and fills the planter. Because it’s sterile, it reduces your tomatoes’ susceptibility to blight and wilt, and doesn’t contain weed seeds. No weed seeds = no weeds = no weeding! Gardener's Supply offers a replenishment potting mix which you can purchase as needed so you can use with your kit over and over. The support cage, when assembled, measures 14-1/2" wide by 21-1/2" deep by 30" high with 8" legs (38" overall). It gives adequate support for average-size plants. But as you know, tomato plants can grow to be well over 3 feet tall. It’s a good idea to add a center stake at planting time for extra support. If you choose a type of tomato that’s anything but a dwarf or bush variety, order cage extensions. Plastic clips for the cage assembly are a bit flimsy. You may need to replace them year to year. You can also try other tomato cages in your planter. Check out different tomato cages to find the right ones for you and your garden. Get the optional planter casters to attach to the bottom of the planter, which will let you to move the planter around on your desk or patio. Mobility allows you to move container out of the sun as growing season wears on or into the garage if frost is in the forecast. You can also move planters around if you need to make extra room. Planter size. Tomatoes have deep root systems. They need space. The planter that comes with the Tomato Success Kit measures 26" long by 19-3/4" wide by 10-1/2" high. Whereas some tomato planters (like those sold at some discount department stores) hold just 11-12 quarts of potting mix, this one planter holds 40 quarts. It’s large enough to accommodate 2 determinate tomato plants or one indeterminate tomato plant comfortably. Water reservoir. The kit’s 4-gallon reservoir is the biggest among other self-watering planters on the market. The reservoir keeps water available to tomato plants, but prevents them from flooding. Tomatoes get stressed if under watered or over watered. All-in-one. The kit contains everything you need to get started growing tomato plants except for the seedlings. Quality. Less expensive self-watering planters have a lower price tag for a reason. They easily crack or fade. (Not to mention the water reservoir is half the size or less.) Go with a durable, weather-resistant planter that will last season after season – not junk. Appearance. The planter planter is available in 3 colors. Versatility. You can use this self-watering tomato planter indoors and out. But read set up directions carefully. The reservoir platform is supported by drainage columns. For indoor use all is well – the platform and columns can stay as is. If you use the kit outside, though, take one additional step to open the drainage holes allowing the water to drain out in heavy rain. Here is what to do: remove the reservoir platform. Use pliers to pull off or twist off the tops of the columns, which make “overflow” holes. Re-secure reservoir platform. Read the set up directions carefully … this is clearly explained in the included instructions. You need to purchase cage extensions if you grow larger varieties and casters to attach to the bottom of the planter if you want to be able to move it around easily. 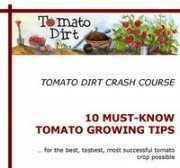 The cost for the Tomato Success Kit is higher than self-watering tomato planters you can find at discount department stores like Walmart. But the growing volume is larger, reservoir size is double or more, and materials are sturdier, less likely to crack, and will last many more seasons. You get what you pay for. Don’t be fooled into planting more than one indeterminate tomato or two determinate tomato plants in your planter. Seedlings may look lonely when you first set them out but they will grow very quickly. Move the planter under cover when rain is forecast to prevent over watering. Read the set up directions carefully, especially if you’re using the kit outside. By opening up the overflow holes in the columns supporting the reservoir platform, you can prevent over watering. Monitor water levels carefully, especially during the first few weeks. You’ll soon adjust to your self-watering tomato planter. More about the Tomato Success Kit.